I live IN her district, am self-employed (yes I WORK), do not qualify for public assistance, can't afford insurance, and therefore seek absolute minimal medical care (no, I do not spend the money I earn on cigarettes or alcohol). I assure you I am not alone. Foxx has plenty of people in her own district who get less than adequate medical care. 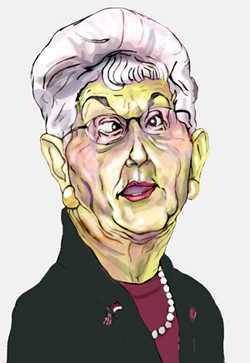 The only thing I agree with you is Virginia Foxx is an idiot. I can not stand her. She hurts any efforts of the Republican Party. Is there any chance she will not run?